The society will be holding its Annual General Meeting on November 14th at the 'Standard Fayre' at the East Lancashire Works on Baron Street, Bury. Proceedings start at 2pm and all C15PS members are welcome to attend. A patch has been issued to correct minor software glitches in the C15PS produced MSTS North Wales Coast Pack - download the patch here. This resolves problems highlighted on the UKTS forums, details in the README included in the zip. This patch does not overwrite patch 5, users who do not have a V1.05 on the DVD disc will need to also install patch 5 if not done so. Users who have a V1.06 on the DVD disc do not need to install this patch. To install simply run the nwc_patch_6.exe and follow the on screen instructions. Due to high demand for the North Wales Coast pack we have unfortunatley run out of stock and any orders placed from today will not be dispatched until sometime next week. We apologise for this but hope to have the backlog cleared as soon as possible. The C15PS produced Microsoft Train Simulator™ North Wales Coats add-on pack is now available. More details and how to order can be found on our shop page. Purchasers of the pack will also need to download and install this patch. We are now half way to our total! The Generator Fund totaliser currently stands at £10,304. A fantastic effort in four months and a massive thanks to those who have donated so far - donations have ranged from four figure sums to £1 sent in cash - it all counts, but we need to do the same again to reach our target. Can you send us a tenner? or perhaps set up a standing order for £1 a month? Remember all donations over £15 qualify for a years membership of the society. Complete a Gift Aid Form and make your money go further. Details on how to donate are here. The generator set was sent to Dowding and Mills for assessment last October and although initial signs were good further inspections revealed that the auxiliary generator had major degrading of the insulation which had rotted away after years of outdoor storage. Unfortunately that was not the only bad news. The Main Generator inter-poles (of which there are six) were not correctly functioning and the machine will require an expensive re-wind. Dowding's have been asked to split the inter-poles down to assess the damage but the society is expecting to have to raise in the region of £20,000 to be able to pay for these repairs along with the general overhaul of both main and auxiliary generators. The first working party of 2009 was to be concentrated on D5705 and a work report is here. As there was a good turnout for D5705, we were able utilise two volunteers on D8233 also; Jim Gough and Kris Mason were able to progress the No1 End Traction Motor Blower modifications and the channel that will mount the traction motor blower was drilled and had nuts welded to the inside of it. At the next working weekend it is planned to have the mounts welded to the floor and the TMB bolted down. The Society held its AGM on November 29th and David Mylett was elected to the position of publicity officer replacing Ritchie Davison who did not stand for re-election. The society welcomes David to the committee and thanked Ritchie for his work during his time in the position. The Society will be holding its Annual General Meeting on November 29th at the White Lion Public House, Bolton Street, Bury. Proceedings start at 2pm and all C15PS members are welcome to attend. Since the last report on the failed engine start-up there hasn't been much progress on D8233 itself. The main problem has been that the loco has been stored at the south end of Baron Street and inaccessible to the restoration team. After consideration of the costs involved in proceeding with the engine start up, the society has decided that at this time the money would be better invested elsewhere on the loco. This doesn't mean the group hasn't been busy, the regular volunteers have been attending the fortnightly working weekends as normal although concentrating their work on the Co-Bo D5705, on which there has already been good progress tidying up the engine bed plate and applying green primer. The Class 15 Preservation Society, the ELR Diesel Department and the Co-Bo Locomotive Group are pleased to announce that agreement has been reached for the same team and project leader currently D8233 to under take the initial restoration on unique Co-Bo D5705 also based at the ELR. Both projects have similar restoration needs, therefore running the initial restorations side by side utilising the vast skill base within the ELR diesel department and Class 15 Preservation Society will benefit both projects. There may also be financial benefits for both locos in the form of discounted sub-contract work based on volume. The next C15PS produced Microsoft Train Simulator™ add-on pack is Class 40's in Blue and features 26 class 40 loco - all in BR Blue livery. The pack features Air and Vacuum Cabviews with 6 Soundsets - so each 40 doesn't sound the same as the last! There are activities for the following routes; Caldervale, North West England V2, Scottish Central, Settle and Carlise & Yorkshire Coast. More details and how to order can be found on our shop page. The next C15PS produced Microsoft Train Simulator™ add-on pack is Baby Deltics and features the 10 Baby Deltics D5900 - D5909 in Early BR Green, BR Green and BR Blue liveries. Cabviews and soundpack and BR M1 coaches in Maroon and Blood & Custard plus a selection of freight stock. There are activities for the following routes; East Coast Express, ELR, SVR, WSR, Burton & Derby (available from uktrainsim.com). More details and how to order can be found on our shop page. The Society will be holding its Annual General Meeting on December 1st at White Lion Public House, Bolton Street, Bury. Proceedings start at 2pm and all C15PS members are welcome to attend. The next C15PS produced Microsoft Train Simulator™ add-on pack is Deltic Six and features all six preserved production deltics in their various guises over the years along with cabview, sounds and acts for East Coast Express parts 1&2, East Lancs Railway, Severn Valley and West Somerset add-ons (available from uktrainsim.com). More details and how to order can be found on our shop page. We are pleased to announce that we can accept orders for two new Microsoft Train Simulator™ add-on packs; ELR Classic Traction and Blue Deltics! More details and how to order can be found on our shop page. We are pleased to announce that we can accept orders for Preserved Heritage Traction, a book that details all preserved diesel & electric locomotives plus multiple units of British Rail origin and its constituent companies. By purchasing through the C15PS a substantial donation will go towards the restoration of D8233. More details and how to order can be found on our shop page. The C15PS sales stand will be out at Bury Bolton Street during this weeks five day Diesel Event at the East Lancs Railway - please do come and support us. The C15PS produced Microsoft Train Simulator™ add-on pack Peak Power is currently out of stock. We are still accepting orders for this product but orders will not be dispatched until later this month once stocks are replenished. The Annual General Meeting was held today, at which twenty one members attend, a number of updates were provided, a couple of appointments and changes to the committee were accepted, and a number of revisions to the existing constitution agreed. First component fully overhauled. We are delighted to inform you that the fan drive gearbox has arrived back from Solutions engineering Ltd.
We are now accepting orders for "Peak Power" our second add-on pack for Microsoft Train Simulator. More details here. Also report and photos from the mini working weekend of 27 & 28/05/06 added. Photos of the working weekend on 13 & 14/05/06 added here. Mouse mat added to the Sales page. Report of the working weekend on 13 & 14/05 added here. Sales page updated to include our latest sales items of 4 designs of mug and a cap as well as including a Paypal shopping basket and printable mail-order form. A few updates to the web site, with the working weekend report for the mini working weekend of 22 & 23/04/06 added here. Photo galleries added for the last 2 working weekends here and here. Additional photo of ADB968000 added here and D8233 here. We are pleased to announce that we have made another major step forward towards restoring D8233 to operating condition with the securing of a working replacement Paxman 16YHXL engine. The engine was sourced via Geoff Davies of Beta Generators in Stockport and inspected by representatives of the society on 01/03/06. 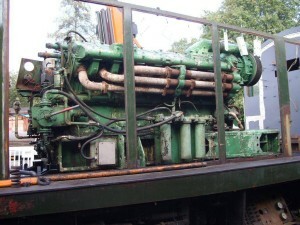 The engine has been used as a static alternator set and is believed to be one of the ex BR ones. Our plan is once it has been transported to Bury to fit the traction governor from D8233s engine connect a temporary fuel supply and cooling system then run the engine up to prove it then place it in dry secure storage until the loco is ready for the power unit fitting. Acquiring this engine will undoubtedly pay huge dividends for us by reducing the time and work needed to restore D8233 as well as putting us in the position of effectively having 2 engines. A few photos of the replacement engine are here. At Bury work has continued with a mini working weekend being held on the 25 & 25/02/06. The work performed included the completion of the removal of the rest of the body side doors from D8233 and the start of removing the smaller external fittings along with more work towards completing the fitting out of our support coach and safe storage of the components already removed from D8233. We would like to extend a huge thank you at all involved in helping us to secure the replacement engine as well as the team of volunteers that attended the mini working weekend. Saturday 11/02/06 was the day of the big shunt to position D8233 and our support coach in to the agreed position at Buckley Wells, this shunt involving moving everything on the line at the side of the old EMU shed to allow D8233 and our coach to be shunted down to the far end, the opportunity was also taken to reposition the vehicles already there In to more favourable positions for the groups involved in them. On Sunday 12/02/06 a start made on D8233 its self with all the body side doors on one side being removed before D8233 was sheeted over to protect it from the elements, Inside the support coach several of the lose components were moved to new storage positions giving us room for not only to store more components as they are removed from D8233 but also giving us a clear workshop area within the coach. A few more photos of the weekend added here. D8233 was today successfully moved by road from Crewe to its new home at Bury arriving In Bury around lunchtime. Click here to view a gallery of photos from the move. Tomorrow will see D8233 shunted in to position next to our support coach. We would like to offer our thanks to all involved in making the move go smoothly. We are pleased to announce that we are now accepting orders for the MSTS add-on pack via post or PayPal! Orders placed before will be posted out after 06/02/06, and it will also be available to buy on ebay after 06/02/06. Photos added to both the Class 15 gallery and the D8233 gallery. More photos added to the move gallery. The Class 15 Preservation Society is pleased to announce we have now secured a long-term restoration base for D8233 at The East Lancashire Railway. Over the weekend of the 14th and 15th of January all loose parts including the exhausters and traction motors were moved from Crewe to our new home at Bury. A few photos of the weekends work can be found here. We would like to offer a big thank you to Martin Walker, Beaver Sports Yorkshire, The Railway Age Crewe, The Bury Diesel Group, The East Lancashire Railway Steam Department, The East Lancashire Railway, as well as all who attended on the 14th and 15th without who this first but important step in the restoration of D8233 would not have been possible. 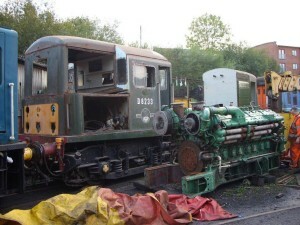 D8233 will be moving to our new home shortly so the restoration can start in earnest. The Class 15 Preservation Society is pleased to announce that an agreement has been reached to ensure that Class 15 D8233 (Currently at the Railway Age, Crewe) is returned to operational condition with the ownership of the locomotive having passed to the C15PS from the previous custodians, The Waterman Heritage Railway Trust. The society wish to thank the contribution made by the WHRT, and we aim to build upon the work carried out so far. A team of dedicated volunteers is ready with the goal of returning this unique loco to operational condition and operating the loco at heritage railways. However, the scale of the task we have taken on should not be understated. This is a long-term project and it will not be an easy restoration to undertake, mainly because much of the original traction control equipment was removed during the locos conversion to a train heating unit. Fortunately, due to the WHRT acquiring a number of suitable replacement traction motors as well as many other spares, along with the numerous offers of help and support which Project D8233 has received in the months since the group was formed, we are now in a position to move forward and make resurrecting this unique survivor from the "Modernisation Plan" a reality! Thanks to an intake of new members from the "Project D8233" group, The Class 15 Preservation Society is now re-launched with a newly elected committee. The "Project D8233" name will however live on as the name given to the restoration team.